Book Reviews | Brush off the dust! History now! Cover the Earth – Early Modern RED! Thus, it takes a unique training to be literate in textile history and Phipps provides us with a fascinating translation for red textiles in the Early Modern era. This quote explains, very neatly, the purpose and relevance of her field to historians. The quality of fabric, the method of production and the dye all speak to the owner and the manufacturer. Thus, the excess of sumptuous materials expensively dyed from the court at Versailles is in marked contrast to the attire of the Jacobean revolutionaries, or even that of the French nobility after the revolution. The quality of a cleric’s clothing, for example, may inform us a great deal about the man’s perspective of his profession or, too, about the wealth of his parish and benefactors. While textiles have this promise, it is not on such a particular scale that Elena Phipps, the Senior Museum Research Scholar and Conservator at The Metropolitan Museum of Art, engages in Cochineal Red: The Art History of a Color, published by the Metropolitan Museum of Art, Winter Bulletin, 2010. In this brief work, she traces the red coloring of the South American cochineal insect, Dactylopius coccus, from its origins in the New World to its eventual spread throughout the globe. To do this she marshals all the resources of the Metropolitan Museum of Art: three thousand samples were examined using high performance liquid chromatography, X-ray fluorescence spectroscopy, surface-enhanced Raman scattering and more, surveying the textiles to establish the red dye used and the material that was dyed. (3) By this means, she follows the dye from the New World to the Old World and back to the colonies and Asia. We are exposed to the political and economic history of European expansion, beginning with the New World. There is also social history related to the pursuit and distribution of New World products during colonization. All this made possible through the collaboration of scientists, archaeologists and historians. 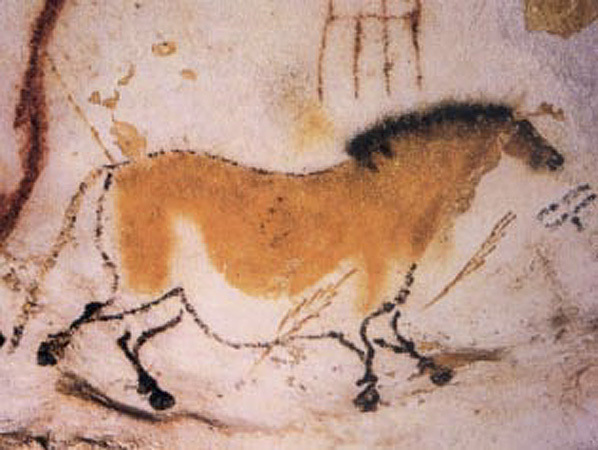 Neolithic cave painting from Lascaux, France. Quick Latin lesson: Rubia tinctorum: Rubia, from the Latin adjective ruber, rubra, rubrum, meaning “red”; tinctorum, from the noun tincta, tinctorum, meaning “dyed cloths, colored stuffs”—related to the verb tingo, tinxi, tinctus, tinctere, meaning “to wet, moisten, dip bathe, imbue; to soak in color, dye, tinge.” The Madder’s blooms are white (the red coloring is derived from the root) suggesting that the scientific name comes from the practical usage of the plant, for which it was better known, than from its appearance. 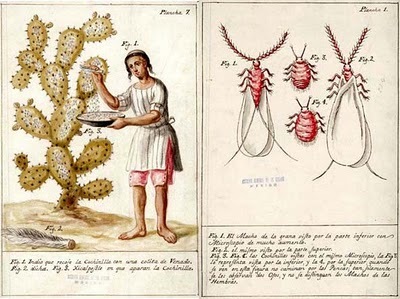 The image shows New World variety of cochineal, male and female, on the right, and being harvested on the cactus on the left. 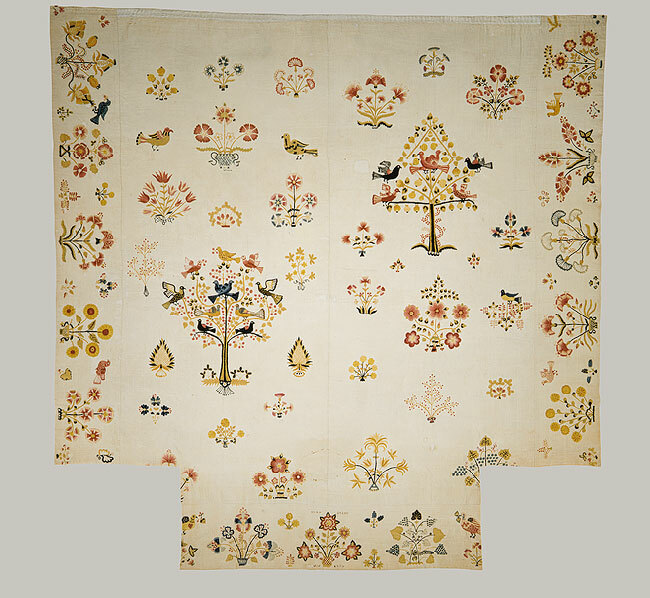 A coverlet from a set of bed hangings by Mary Breed of Stonington, Conn., 1750--cochineal pink-dyed wool embroidery. The work is richly informative and provides insight on Early Modern politics and economy from a unique perspective. Its brevity leads to numerous discussion points as many aspects of social history, are only touched on briefly or merely implied. While I will summarize three such points, here, I confess I am somewhat disappointed on this score after the passion and enthusiasm implied in her prologue (quoted at the beginning) where she suggested an excitement for the textile crafted by an individual’s hands. This implied personal connection is not felt throughout her exploration of the New World insect’s travels and influences. The first of these points, is the brief anecdote relayed by the Spanish soldier, Captain Baltasar de Ocampo, who described the execution of the last living member of the Inca royal family, Tupac Amaru. As he was marched to his death Ocampo described the vivid Inca red attire worn by the king, including his Inca “crown” adorned with red fringe that hung over his forehead. Apparently, this was the lone marker of his being Inca, because Ocampo describes him as wearing a Spanish doublet! It is at this point that Phipps discusses the laws in the Spanish colonies and the sumptuary laws in Europe. (25-6) It is affecting that Tupac Amaru wore the traditional color of his rank, but could do it only in the clothing provided by his captors as they lead him to execution. In this instance, if we had the doublet, the language of the textile would have been one foreign to the man who wore it—the maker having no connection to the wearer. Secondly, there is the almost passing reference to the Dutch supplying the English their red uniforms. Phipps says that in 1625 the Dutch employed fifty thousand people to dye woolens destined for England. Beginning, at this time and continuing until the late 19th century, the British army purchased cochineal red-dyed uniforms from the Dutch for its army. (28-9) This is instructive for students of American history who learn about young George Washington’s frustration with the habits and manners of the army under the successful British General Edward Braddock who seemed too arrogant to adapt to American realities of war (or, for that matter to grant officers’ commissions to the colonists). 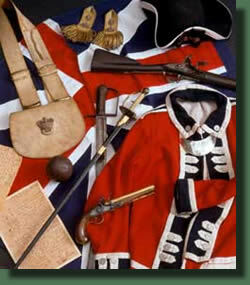 The very idea of camouflaging the army was entirely contrary to the point of the red coats. They were clearly meant to demonstrate the wealth and, thus, the power of the British crown. The bright scarlet coats sent a message to all opposing forces. The British army included other units in the 18th century who would wear green, a more concealing color, but the British red coat regiment was clearly intended to intimidate by being seen, marching with precision—to be a spectacle! Europeans spread the color literally across the globe where it interacted with the local cultures creating new styles fused together by the young but active global economy. Phipps captures that sense of fashion and flair primarily with the collection of the Metropolitan Museum of Art and some samples from other institutes. It is a beautiful way to follow world-altering historic events of such dramatic impact and variegated consequences. 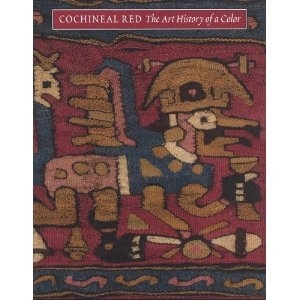 And, a series of videos put together by the Stephen F. Austin State University’s Ralph W. Steen Library on the harvesting and manufacturing process for cochineal red: Cochineal Information, Breeding Cochineal for Harvest, Spread of Cochineal from Mexico and Painting with Cochineal. Brunello, Franco. The Art of Dyeing in the History of Mankind. Cardon, Dominique. Natural Dyes: Sources, Tradition, Technology, and Science. Finaly, Victoria. Color: A Natural History of the Palette. Forbes, R.J. Studies in Ancient Technology. Vol. 4, The Fibres and Fabrics of Antiquity . . . .
Greenfield, Amy Butler. A Perfect Red: Empire, Espionage and the Quest for the Color of Desire. — “American Cochineal in European Commerce, 1526-1625,” Journal of Modern History. Phipps, Elena. “Color in the Andes: Inca Garments and 17th-Century Colonial Documents,” Dyes in History and Archaeology. — Johanna Hecht, and Cristina Esteras Martin. The Colonial Andes: Tapestries and Silverwork, 1530-1830.